LED landscape lighting is the clear standard over incandescent landscape lighting. It’s all we install, and here’s why. Lower maintenance costs and less maintenance time. Over the lifetime of your landscape lighting system, you will replace many fewer LED bulbs than incandescent bulbs. If you ran your LED landscape lighting system for eight hours every night, the bulbs would last for 15 years before a replacement was needed. Energy savings. LED bulbs only use one-third the amount of energy as an incandescent bulb. That’s some amazing savings on your energy bill! No bugs! The least known benefit of LED landscape lighting is that this kind of system doesn’t attract bugs. Who knew your lighting system could make your BBQs and garden parties more enjoyable? The installation of LED landscape lighting is more expensive than an incandescent lighting system, but the costs are offset by the lifetime maintenance savings. Interestingly, with energy-saving LED systems, we often use less wire and smaller transformers, which can actually reduce the price of installation. 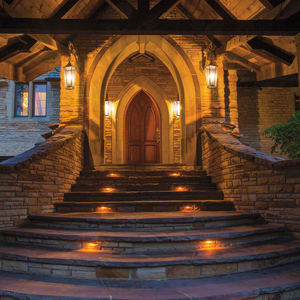 Give us a call for a personalized quote and picture your home illuminated by beautiful LED lighting!